Dear Fellow Bloggers, esp. the Junta at Kolkata. 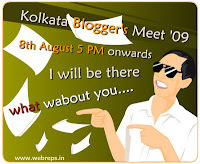 Our “Shonar Kolkata”, is the host for blogger’s meet 2009.
wow...wish they'd hav something like this for Indian bloggers in soton :) ..yu goin? Oh thanks for informing...will definitely try to be there n meet u'll!! Lucky you.I have attended two in Delhi and both were excellent experience. A meet! How nice :-) Enjoy. wow, i wish me too was present. when is south India bloggers meet? No idea about the south India bloggers meet. However how much I wish if you could be a part of this event this time. We can meet buddy! How wonderful is that..I wish I was there..do take the camera and share the details!! btw is the comment thingy on my blog still causing issues...ek baar dekh kar batao mujhe!!! Want to, but kolkatta is too far! most awaited meets ... great to hear that it's finally HERE !! Kya banaya? aur kyo? Ha haa...mujhe to kuch bhi samajh mein nahi aa raha hai!